Deep Six is a V-shaped like extension from the mainland continuing north underwater and consists of small as well as huge rocks and boulders covered with soft coral and sea fans. Situated on the north tip of Island 7 (Koh Pa-Yu), Deep Six‘s depth ranging from 5 - 40 meters and is one of the best boulder sites in the Similan Islands. It’s an exciting deep dive site on the Similans and it was named after Island 6 before the islands were renamed (Elephant Head Rock lost its status as an island), hence the name Deep Six. At the biggest boulder in the centre, a pile of smaller rocks forms exciting swim-throughs, caverns and tunnels that rise from about 22 meters to about 12 meters. Currents are moderate to strong, particularly at the northern pointed end of the reef. 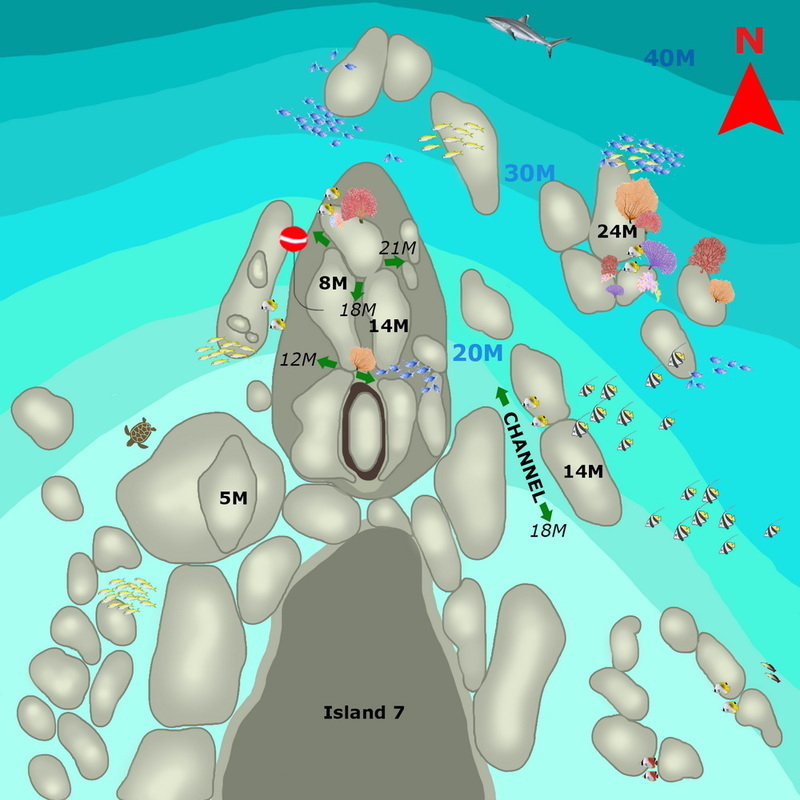 Depending on current direction, descend on either northeast (when north current) or northwest side (when south current) of the island and follow current around the tip and cross to the shallow coral area. The mooring line is a little west of the centre and will help you to get down easily without drifting away from the boulders. It is best to start deep, so you can use the current to ascend slowly upward, passing as many swim-throughs as possible. Most of them are at 12 – 18 meters depth. Because of dive profiles and currents, it is advised to stay close to the rocks since Deep Six is a more demanding dive site. The whole scenery at Deep Six is truly magnificent. Schools of groupers, giant trevally, rainbow runners and barracudas are all over the place at different depths here. Lobster, shrimp and nudibranchs dot the scene but yellow little boxfish steal the show. In the caverns oriental sweetlips and harlequin sweetlips like to shelter away. They have big, fleshy lips and usually live in pairs of small groups around nooks and crannies. Sweetlips' colour and pattern change throughout their lives. Juvenile sweetlips generally look quite different from the adults, they are white-spotted and have a complete other colour, even orange. Small juveniles often live solitary lives on shallower reef sections and have an undulating swimming pattern, possibly mimicking poisonous flatworms as a means of predator avoidance. If you look carefully you can even detect ghost pipefish or even frogfish, our camouflage champion. The camouflage aids in protection from predators and to enables them to lure pray. Many species can change colour; some are covered with other organisms such as algea. In keeping with this camouflage, frogfishes typically move slowly, lying in wait for prey, and then striking extremely rapidly, in as little as 6 milliseconds. Giant barrel sponges and gigantic sea fans on the east are home to red fire goby and blennies. Blennies are superficially quite similar to members of the goby but they are not related. Whitetip reef sharks and blue-spotted stingrays hang around in the depths on the sand and will slowly swim away from you when they find you are approaching too close. At the shallow coral garden hawksbill turtles are a common sight. 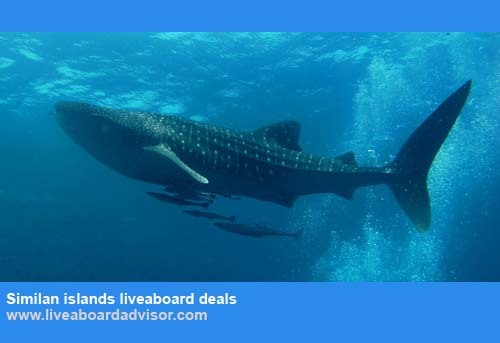 There is plenty to see here at Deep Six, but for some reason, there are very few sightings of either of manta rays or whale sharks, generally they simply pass by onto other Similan Islands during the diving season. Unfortunately, some tsunami 2004 coral damage is still visible, but reef life is recovering. Despite of that, Deep six will surely impress you with its topography, visibility and wonderfully diverse marine life. 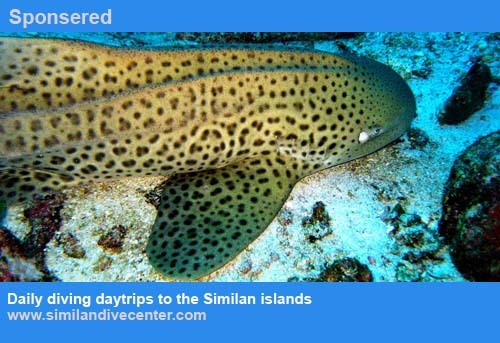 Deep Six is a very popular dive site and often on liveaboard cruises schedules.